G.I. Joe: A Real American Hero one of the many cartoons that I grew up with. I had the action figures and the vehicles and had battles with my friends, so I was hyped to see this show again, and especially that I would get to see the episodes in order. As a kid, I had no idea which order the episodes came in. Who was introduced first? When did other guys and vehicles get introduced into the series? So watching again, I found myself really surprised by a lot of things. First, I didn't remember very much about the characters at all. I was able to pick out Snake Eyes right away, as he was one of my favorites, and then Cobra Commander, Destro, and the Baroness, but after that I pretty much had to wait for someone's name to be mentioned before it would come back to me, and even then sometimes I found myself thinking it wasn't familiar at all. The next surprise is that the first part of the first season was actually a collection of three separate miniseries, spanning five episodes per miniseries. 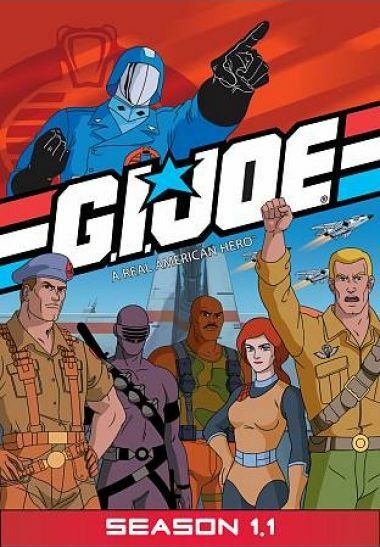 I always remembered GI Joe as having standalone episodes aside from a couple possible two-parters, so I was way off about that. It isn't until after episode fifteen that we start getting the more conventional one plot per show. Of course, the storylines in the miniseries aren't exactly deep. You could pretty much watch them out of order and still easily figure out what's going on. Another surprise was how early some of the characters were introduced. Zartan and the Dreadnaughts in the second miniseries? The Crimson Twins in the third miniseries? I could have sworn that these characters came in way later. Oh, and some of the character designs changed between the first and second miniseries. Most notably was Snake Eyes, who upgraded his goggles to the cool-looking visor, and Cobra Commander who replaced his helmet with a blue hood. Speaking of Snake Eyes again, it was cool to see how he got his pet wolf, Timber. Watching these episodes again after all this time brought Surprise after surprise. Did you know that another character, Shipwreck, wasn't originally a Joe. He was apparently a freelancer, who I guess they officially made a Joe at some point, since you'd see him in their base and privy to sensitive information. The biggest shock of all, however, was how incompetent the GI Joes were. Holy crap, these guys are supposed to be the best of the best and yet they screw stuff up all the time. The only way they are able to hold their own against the evil forces of Cobra is that the Cobra organization is also filled with incompetent morons. There are so many examples of this that I could probably write a thesis about it, but it's a kids' show so I'm not going to get into all that. And how can I blame them, really, when they live in a world where even the laws of physics don't seem to apply much of the time. Take for instance the situation where Cobra drove a cube the size of several houses onto an ice cliff. Well obviously it was stable enough to hold the enormous weight of the cube and the giant platform that looks like the space shuttle's mobile launcher platform and a bunch of Cobra goons, so what do the Joes do to stop Cobra? Yodel! And that collapse part of the cliff! Not enough to bring down the cube, but still... they couldn't have used a bazooka? You've got like thirty of them! No, they'll risk their lives sneaking around behind the enemy so... uh... they can give Cobra a stern talking to? And while I'm on the subject, have you noticed how all these guys are worse shots than stormtroopers? At least, when they're aiming at people. If they aim at anything else they can hit it spot on. So while neither the Joes nor Cobra troops can hit anything, Shout! Factory sure hit a home run with this release. Not only does it contain the first 22 episodes of G.I. Joe: A Real American Hero , but it also has a bunch of extra features. The best of these are three rather short segments titled "Looking Back With Writer Ron Friedman", where Ron Friedman tells about about creating the toys and series, and it is all very interesting stuff. Wish there was more of that, but instead we also are given some of the old toy commercials, and the original 1963 Toy Fair video presentation. Oh, and also included in this box set are temporary tatoos... definitely not as cool as the magnet found in the Transformers Season 1 box set. One more thing that I want to mention is that on my DVD player, all of the four discs would get stuck before they even reach the DVD menu. I have to press the stop button, then play, and that starts it playing from the first episode, so then I need to press the menu button to get to the main menu. Our DVD player is 10 years old, but still, there must be something funky going on in the DVD boot up code to make it do that on any DVD player.